Thank you for joining us! This page will be updated periodically to provide news about Citizens for Lakeview Preservation’s efforts to create and develop Lakeview Legacy Park. 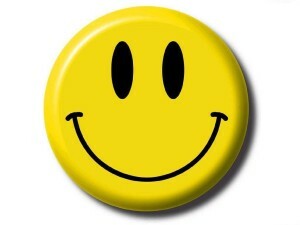 Look for news articles, fund-raising events, opportunities to volunteer, and the latest improvements at the park. April 2019 FINALLY the snowdrifts have melted away and the first signs of new growth have started to appear in the park. The Prairie Smoke in the perennial garden are already getting green and the Rudbekia laciniata “Herbstonne” has a proliferation of sprouts. Those tall yellow coneflowers, located amidst the tamaracks, have had two good years of growth and could easily reach 7 feet this year! Buds have appeared on most of the trees and it looks like most have survived the winter. 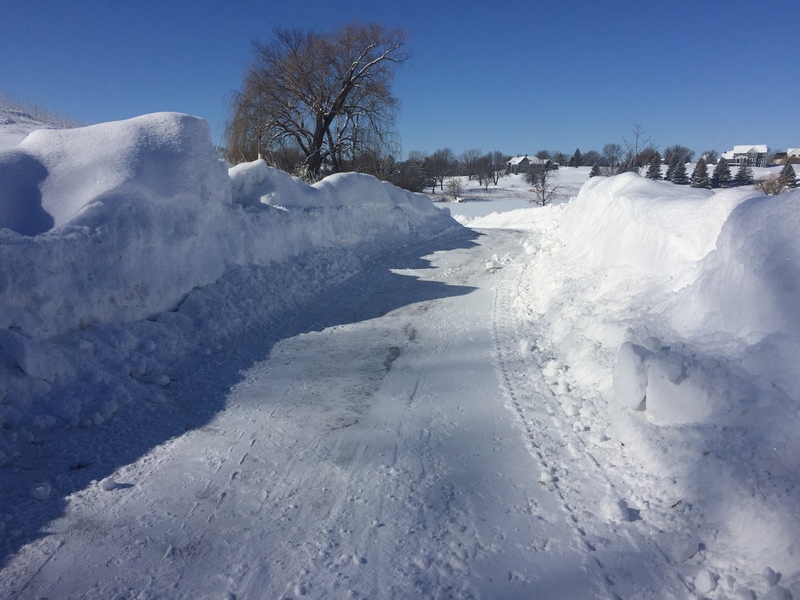 Those who ventured out into the park, especially during our record snow month of February, should have appreciated the snowplowing efforts that kept the trails open virtually all of the time. (see photo showing the south entrance to the park). This year should see the groundbreaking of the new gazebo, as significant effort has been put into refining the design to keep costs reasonable while providing a structure that will blend well with the architecture of the neighborhood. There is also an area focusing on Native American plants and history that is being developed on the north side of the park. Look for several more native trees, shrubs, and plants to appear in several other areas as well. June 2018 After a long and cold winter most of the trees, shrubs, and perennials planted in 2017 are starting to thrive, as they overcome the first year of transplanting trauma. There were a few casualties, most of which have been replaced or are awaiting warranty replacement. 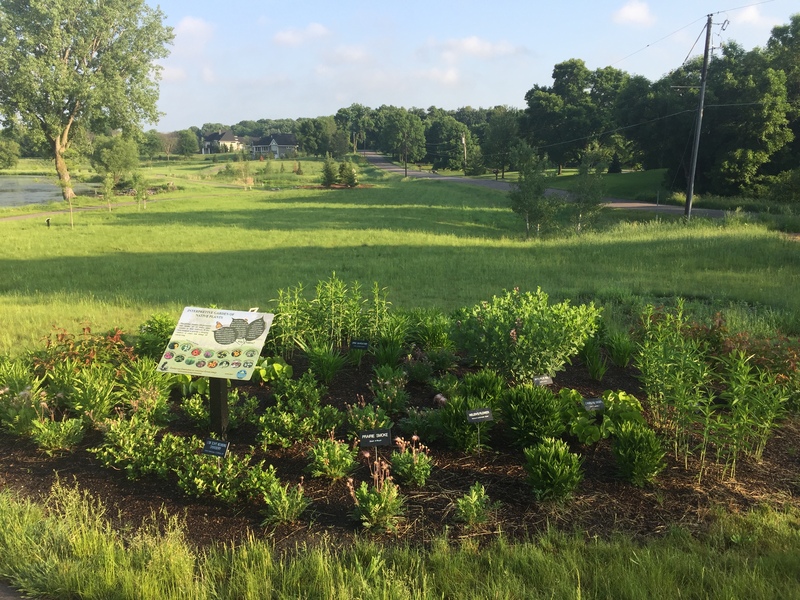 Native perennials in the interpretive garden (photo at left) have increased greatly in size over last year and are ready to burst into colorful blooms. During the first week of June twelve new trees were added: 1) Five quaking aspen across from the large cottonwood 2) Three pin oaks on the northwest side of the park. 3) Three tamaracks close to a large willow that was removed last fall 4) A new mountain ash where the trail splits to form a loop. 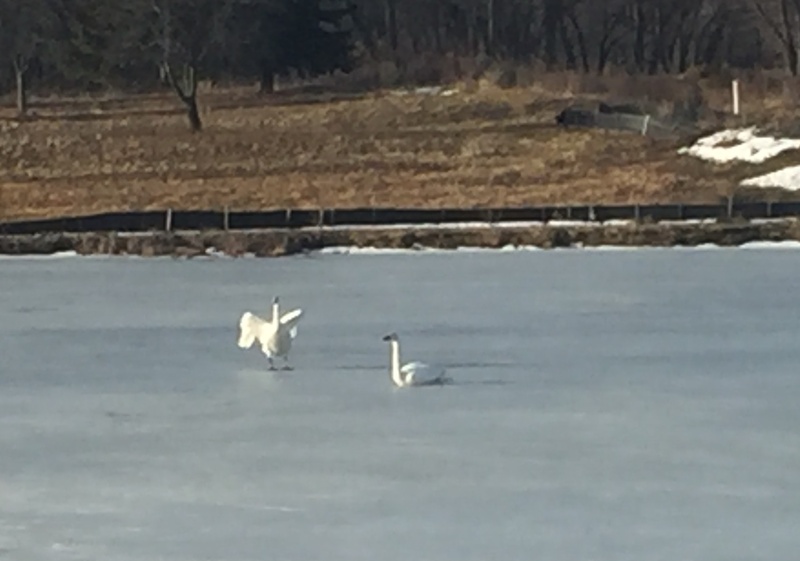 Plans for the rest of 2018 include several additional native tree species (cedar, oak, and locust), two new perennial gardens, a wetland planting area, and additional native shrubs for shoreline stabilization, along the trails, and adjacent to the new gardens. There is also a desire to add two additional benches on the north and south hillsides of the park and to complete at least one of the planned historical signs. Efforts are also continuing to complete a final design and cost estimate for a planned gazebo in the loop area of the park. January 2018 Citizens for Lakeview Preservation, Inc. is delighted to announce the addition of Steve Ruce, owner of Heliotrope Garden Design to its Board of Directors. The Board would also like to thank Steve Bell for his role in establishing Lakeview Legacy Park and for serving on the Board of Directors from its formation in 2013 until the present. Trees: A total of 19 native trees were put in by tree spade in 2016, including 9 white pine, 5 balsam fir, 4 sugar maples, and a clump of river birch. A few of the balsam need to be straightened as soon as the ground softens, but all appear to be doing well. More trees will be added in 2017, starting with a group of tamaracks near the small wetland and several river birch along the pond. Ground Cover: Areas of prairie grass as well as ‘no-mow’ fescue mixes were seeded late in the fall for spring germination. Prairie Restoration, which is working with the Lakeview Development, will add more fescue to the northern portion of the park this spring. Native plants will also be added in the wetland buffer areas. Benches: Two stone benches were placed in 2016 and several have been requested for 2017. The first one should be placed by the beginning of April. Signs: A second welcome sign is ready for the north entrance and work is in progress for the first historical/educational sign. Fountain: Grant Wenkstern, former owner of the Lakeview Golf Course, has donated the fountain, pump, and timer so that it can be re-installed in the small pond this spring. We are very grateful as this will bring back fond memories of the course. Gazebo/Learning Shelter: Efforts are underway to solicit plans and bids for the structure shown in the PARK section of this website. The MCWD is being consulted to make sure that there are no issues in the placement of the structure. Trails were plowed this winter (thanks to Lakeview Development) and continue to be used on a daily basis. Several wet and muddy areas will be addressed this spring. 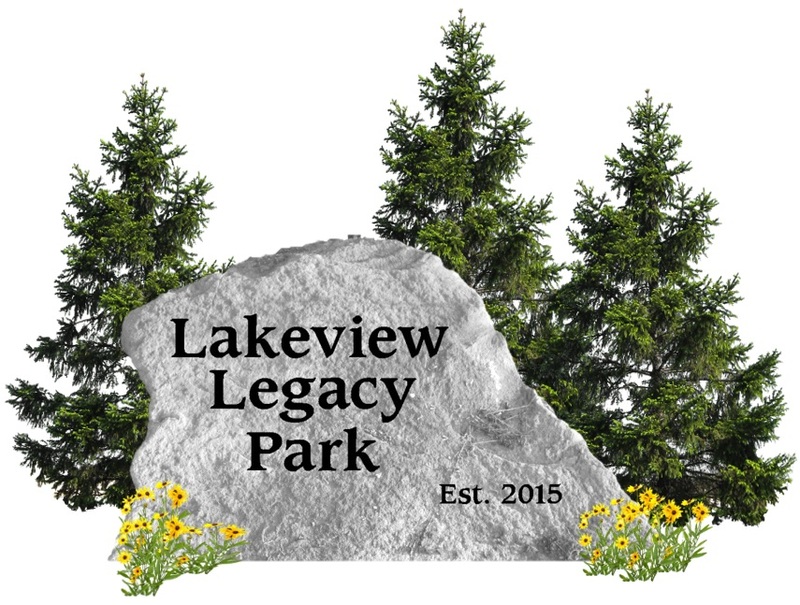 If you would like to volunteer to help with planning, planting, or brush removal at the park, please drop a note to lakeviewlegacypark@gmail.com, or call 651-334-1690. September 2016 Update Delays due to weather and other factors beyond our control made it difficult to provide updates in 2016, as expected completion dates were always changing. However, in the past several weeks real progress has been made: Trails have been graded and compacted and were paved on Friday August 30th! They look great! Final grading will bring black dirt and seeded grass to the edge of the trail. boulder that will be set in front of the balsam fir as soon as the ground is dry enough to support the 32 ton crane! Welcome signs describing the park and its use are ready to be installed at each trail head, as soon as paving is complete. Benches Two donated benches with memorial plaques are scheduled to be installed on October 4th. Electricity has been extended from the old pump house site to the center of the park, where it will be available to run the pond fountain and provide any needed power for the learning shelter. Restarting the fountain has been delayed until spring when it will help to reduce algae and invasive plant growth before it starts. 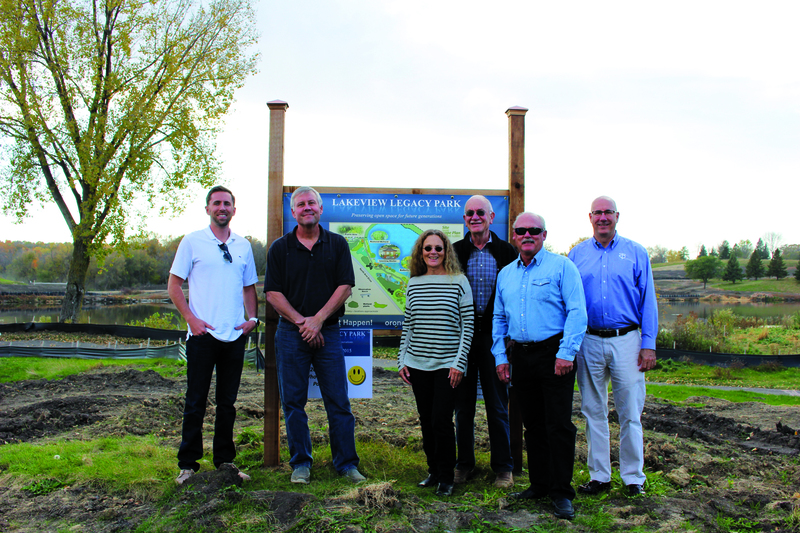 October 15, 2015 Lakeview Legacy Park is now a reality! 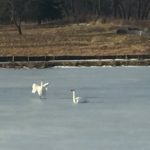 The land has been secured forever as a public park with the granting of a conservation easement by Source Land Development to Citizens for Lakeview Preservation, Inc. Thank you to the 183 people who have donated thus far, and especially the 65 who have become Friends of the Park, Patrons, Founders, or Benefactors. With the site assured, Phase 2 – development of the park – will proceed as donations are received. CLP still has a matching commitment for the next $25,000 in donations and the combination will be matched by Source Land. The CLP donation target to complete development is $100,000 with approximately $10,000 available at this time. Grant applications for specific projects are also in preparation. Opportunities will now be available for specific donations including trees, benches, pavers, and interpretive signs. More specifics on these options will be forthcoming. Construction of the park trails should start soon and we hope to move several large trees into the area near the temporary park sign, once grading has been finalized. If you have not already contributed please consider these specific opportunities to make a difference. Stay tuned to this page for updates on park news and progress! ……………………………………..
October 7, 2015 Donations received in the past several days have brought us very close to what is needed to secure the conservation easement and the future of Lakeview Legacy Park! Once the easement is purchased, subsequent donations will go for specific tangible improvements, like the trails, trees, plantings, benches etc. We hope that some improvements will still be made this fall, before the winter sets in. There have already been a number of inquiries about specific donation options and we will be communicating more about these options as soon as the Park land has been secured. Meanwhile, at the site excavation of the green from the 17th hole of the golf course has been completed but still awaits final contouring. A new culvert has also been installed that connects the large pond to the nearby small wetland. This is intended to cause water to flow into the pond when there has been a lot of rain or snow melting. A new trail will eventually be made over the culvert and at a higher elevation than the previous cartway. 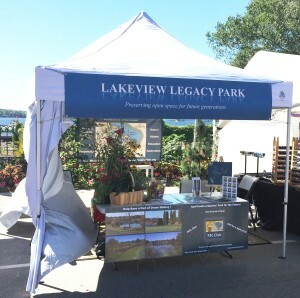 September 14, 2015 Perfect weather and large crowds helped CLP introduce Lakeview Legacy Park to attendees of the James J. Hill Street Fair this past Saturday and Sunday. Visitors included former Lakeview golfers, residents of the Lakeview area who had moved away, Orono and Minnetrista neighbors as well as many folks interested in preserving open space and a part of history. Over 70 made on-site contributions to preserve their square foot (or more) of Lakeview in perpetuity. Others took donation forms to contribute by mail or through this website. We were gratified that several individuals with landscaping and preservation experience also expressed a desire to get involved in developing the park once the easement purchase is complete. Thanks to all of the CLP volunteers who helped at the tent! September 4, 2015 Digging and grading have begun on the park site as Source Land Development fulfills its obligation to remediate residual mercury remaining from past pesticide use on the greens of the former golf course. A temporary road was built to allow equipment to access the green. Grading will restore the previous contour of the land as soon as the work is completed. Grading on the south end of the park site designed to route storm water toward the pond and away from North Arm will also commence in the next several days. Trails connecting the development to the site are also under construction and some preliminary trail work within the site will also be starting soon. All graded areas will be seeded and mulched by the construction company to prevent erosion. September 12-13, 2015 CLP has registered to participate in the James J. Hill Days Street Fair in Wayzata. Please come out and see us at the CLP tent. Volunteers are needed. Hours are 11-6 on Saturday and 11-4 on Sunday. August 27, 2015 The City of Orono approved a temporary (90 day) sign permit allowing CLP to erect a 3′ x 5′ sign that will display the park site plan and offer brochures to those interested in additional information and/or donations. August 20, 2015 Minneapolis Star Tribune publishes an article about the proposed park: “Foes come together in Orono for Lakeview Golf Course project” (www.startribune.com/foes-come…for-orono…/322003041/) Please note that the article incorrectly stated that the conservation easement would be jointly owned by the Lakeview Homeowners Association and CLP. In fact, CLP will be the sole owner of the easement, which defines the features, use and limitations of the park in perpetuity, regardless of who holds title to the land. CLP was advised that purchasing the easement was the best way to assure its vision of the park as described on this website. Members of the public will have the same ability to use the park created by the easement as will members of the future homeowners association. August 19, 2015 Source Land Development began treatment of the large pond adjacent to the park site to reduce algae. DNR permits were required and treatment will continue in the spring. June 22, 2015 Orono City Council approves final plat of Lakeview Development, including provisions for a 4.5 acre privately-owned park. March 26, 2015 Citizens for Lakeview Preservation, Inc. receives tax-exempt 501(c)(3) status from the IRS. February 24, 2015 Meeting to consider park plan and features. Excelsior Public Library Conference Room – 2 pm.